Today is the first day of Chanukah, which means that it will be the second night this evening. Jewish days officially begin when the sun sets, therefore, the days begin at night and so do the holidays. Many people consider Chanukah the Jewish gift giving holiday. But when my parents were children, all they received for the holiday was gelt, which are chocolates in the shape of coins. According to the Brandeis University professor Jonathan Sarna (“Hanukkah Gifts”, My Jewish Learning), Jews used to exchange gifts on the holiday of Purim. The tradition shifted to Chanukah in response to Christmas. After all, it’s really hard to explain to children that no matter how good they are, Santa will not give them gifts. Chanukah is a historic holiday about survival and miracles. It commemorates events from more than twenty-one centuries ago, when a small band of Jews defeated the Seleucids who were trying to force the Jews to abandon their faith and embrace Greek traditions. As the story goes, when the Jewish rebels rescued the Temple in Jerusalem from the Greeks, they found enough oil to burn for one night. Miracle of miracles—the oil burned for eight, which gave them enough time to get more oil. So the holiday is about oil, and what better way to celebrate it than by frying food in oil! I grew up eating potato latkas because I am of Ashkenazic decent, in other words, my family came from Eastern Europe. But when I got older I discovered the wonderful tradition of eating sufganiyot, the round jelly donuts eaten on Chanukah. It’s an Israeli tradition, and a yummy one. That brings us to today’s recipe. On my fantasy world of Awan, they have a winter festival to celebrate the shortest night of the year when their two moons rise simultaneously. As it so happens, the Awan also like to fry food in oil during this holiday: I couldn’t resist re-creating that tradition. 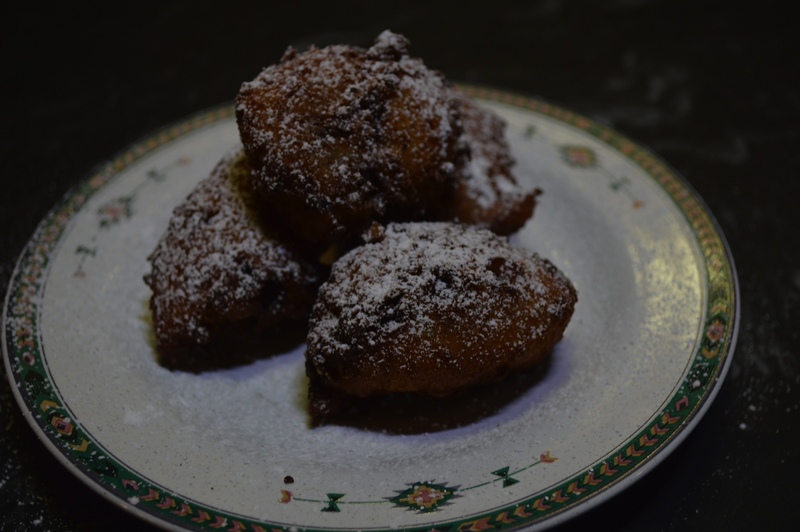 And since I’ve been writing about the Asa tribe, I knew I had to create a recipe for using ingredients from their tribe, and I wanted it to be simpler, and less time consuming than good yeasted doughnuts, not to mention gluten-free. Which led me to—fritters! Okay, so it’s not what you might consider health food (the Asa are health nuts) but sometimes food just needs to be good for the soul. **Vanilla extract is usually blended in bourbon. Most bourbons use gluten grains, however, it is believed that the fermentation process destroys the gluten protein. If you suffer from celiac and do not want to take the risk, you may want to use fresh vanilla bean. Here’s an article for more information. 1. Mix gluten-free flour, xanthum gum, baking powder, and salt. Set aside. 1. Beat eggs in a separate bowl. 2. Add the sugar and vanilla to eggs and mix well. Add the goat cheese and mix well. 3. Add the flour mixture one tablespoon at a time. Blend well between each addition. 4. Add ginger and chocolate chips. Mix. 7. Place paper towels on a sheet tray or cookie sheet and set a cooling rack on top. 6. Use a tablespoon to add a few (about four) small dollops of batter to the oil. Turn occasionally. Fry for 1 ½ to 2 minutes until they turn deep gold. With a slotted spoon or a spider, remove the fritters from the oil and place on cooling rack. A wonderful read, Gail. I must confess to not really being aware of what the holiday is all about. Thank you, Azlin. I think the meaning of the holiday gets lots in the shuffle sometimes. I’m so glad you enjoyed the read.